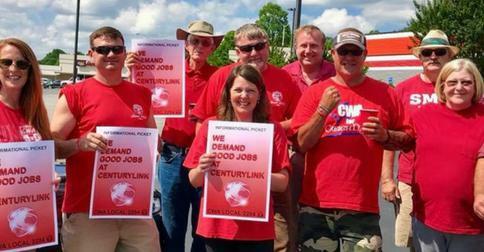 CenturyLink employees in Virginia are represented by CWA Local 2204. The Tenative Agreement was ratified! Contact Local 2204 for the latest news. Pennsylvania CenturyLink employees are represented by CWA Local 13000. The Bedford-Martinsville contract will expire September 30, 2019 and the "United Butler" contract will expire on October 31, 2020. CWA Local 2204 members ratified their CenturyLink contract! CWA Local 2204 Bargaining Team is pleased to announce a Tentative Agreement has been reached with CenturyLink in Virginia. CWA Local 2204 reports negotiations with CenturyLink in Virginia begin on May 22, 2018. The CWA Local 13000 Bargaining Team and CenturyLink reached a tentative agreement for the Butler, PA members today! The CWA Local 13000 Bargaining Team and CenturyLink continued meeting this week to negotiate the United Butler contract.